This richly illustrated essay features photos of rare lacquered works, including a suit of armor with an image of the deity Fudo-Myoo, a cabinet shaped like a monk's backpack, a tiered picnic set, and a large seated Buddha. Find out about Zeshin Shibata's lacquer art and methods of decorating lacquerwork with gold and silver. 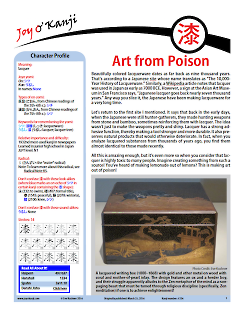 Also learn about lacquer toxicity and the meaning of "japanning"!